All summer long, I dread the fall. No more tomatoes or corn, no more daylight until 9pm, cold weather is around the corner, and the produce is much more scarce. However, when I make things like this potato gratin, I am reminded why I love cooking seasonally: all the seasons have their own special veggies that are open to so many dishes and variations. 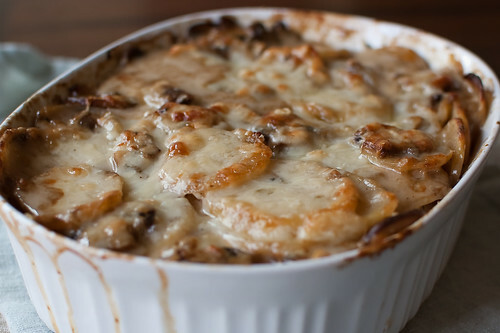 I love mushrooms and potatoes in the fall and winter, and let's face it: melted cheese is good any time of the year. I have always loved potato gratin, and I'm pretty sure my mouth started watering as soon as I read the title of this recipe. Potatoes = good. Mushrooms = good. Gruyere = good. Its hard to mess up. Especially when heavy cream is involved (though to be honest, I subbed at least half of the cream for half and half, and the dish was still incredible). I made a fall harvest meal the night I served these potatoes: grilled maple-cider glazed pork tenderloin and sauteed Brussels spouts accompanied the gratin, and it was truly a delicious dinner. I personally think potatoes should be in mashed potato form for Thanksgiving, but if you are looking for something a little different, that is elegant and upscale, this would be a lovely addition. Melt the butter in a large Dutch oven over medium-high heat. Add the onions and mushrooms, and cook, stirring often, until the onions are softened and lightly browned, and the mushrooms have released moisture and it has evaporated, about 15 minutes. Add the garlic, thyme, salt, and pepper, and cook until fragrant, about 30 seconds. Add the wine, and scrape up any browned bits on the bottom of the pan with a wooden spoon. Cook until most of the wine has evaporated, 3-5 minutes. Add the chicken broth, cream, and bay leaves. Stir in the potatoes, one handful at a time, stirring after each addition. Cover, reduce heat, and bring to a simmer. Stir often, and cook until the potatoes are mostly tender, about 15-20 minutes. To test, pierce a potato with a paring knife. It should be able to slip in and out of the potato with little resistance. Stir in half of the Guyere cheese. Discard the bay leaves, and pour the potato mixture into a 9x13 inch baking dish. Press gently into an even layer. Sprinkle the remaining cheese over the potatoes, and cover with aluminum foil. Bake until the mixture is just warm, 30-40 minutes. Remove the foil and cook until the cheese is golden brown, and the sauce is bubbling, 10-15 minutes longer. Remove from oven and allow to cool 10 minutes before serving. This dish looks amazing. 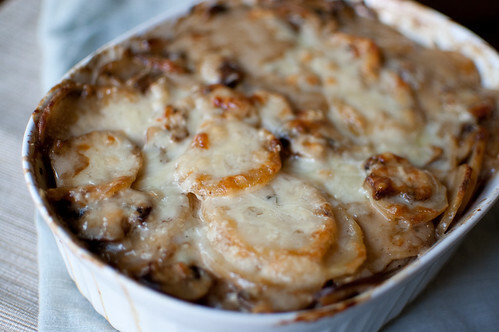 I love cheese, mushrooms, and potatoes (but especially CHEESE!). I love how in the photo it has oozed over the sides of the casserole dish. Yum! That looks incredible. I'll be making it for Thanksgiving - if not sooner! Oh I love Gruyere cheese! These potatoes sound tasty. But I have to agree, for thanksgiving, potatoes get mashed! Hmm...well, for Thanksgiving at my parents', we'll have mashed potatoes, but for the turkey dinner I'm making for my husband and myself this weekend (Fauxgiving), I have a potato mushroom gratin planned. But not this one. But this one is by Cooks Illustrated, and based on the source, it can be made in advance. (Although the instructions for this aren't included in your recipe. Just before baking?) I might need to rethink my plan! I agree - melted cheese makes anything good! This looks like a dish I saw in last month's Bon Appetit. Must make soon! Yeah, I didn't include make ahead - maybe I should add it to the post. Yeah, just bake a little longer. The book says to wait to put the cheese on top until just before you bake it, but I see no reason why you shouldn't store it w/the cheese already on. I agree with your equation of what = good! This looks fantastic and having the mushrooms in it...mmmmmmmm!!! Yum! Nice and creamy too! The perfect fall comfort food. Thanks for sharing! I can't make this. Oh, I would eat that whole damn thing myself. It looks amazing. But this would be a perfect reason to have people over to have to share it. Hi! I really want to make this for Christmas dinner. But, I'm curious if you would help me with the make-ahead instructions? Is this something I can make the night before and store in the fridge until time to bake the next day? Thanks in advance for the help and for providing a bit more details. I have three or four CI books, but not this one - drat! Well, I made it for Christmas, pretty much following the directions faithfully. The method worked just fine - a total winner in that regard, especially if you're like me, someone who has made potato gratin before and has to cook the bejezzus out of it to ensure that the potatoes cooked thoroughly (even after thin slicing!). The dish itself was bland for us. I had 9 folks over at Christmas and despite people actually requesting potato gratin prior to the event, I had to beg people to take home the large amount of leftovers (this dish makes a complete ton). Anyway, thanks for sharing - I think I'll try the method itself with other combinations of flavors, or try amping up the flavor here. I just saw your first comment - so sorry I didn't reply with the make-ahead instructions. They are pretty much the same, just cook a bit longer. So sorry!